Somali Cats. 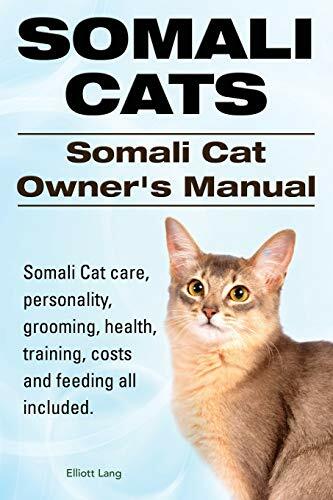 Somali Cat Owners Manual. Somali Cat care, personality, grooming, health, training, costs and feeding all included. Everything you need to know about keeping the Somali Cat as a pet. This is another very informative book by Elliott Lang. As an animal lover, he enjoys writing animal books and advising others how to take care of their animals to give them a happy home. Somali Cats care, personality, grooming, health, training, costs and feeding all included. The book is written in an easy to read and understandable style. In a straight forward, no nonsense fashion, Elliott Lang covers all aspects of keeping Somali Cat as pets, a must have guide for anybody passionate about Somali Cats. It is not surprising that the breed is a favourite of many home owners and cat lovers. The Somali breed is one breed of cat with many clubs established by Somali cat owners across the world. Elliott Lang says: I have always been in the company of animals. That is the one thing I am most thankful for. My lovely pets have always been around to provide unconditional affection and love when I needed it the most. My father was instrumental in making me grow fond of animals. He always kept me around animals. My family have always been hands on with the pets in the household. Whether it was bathing, feeding or taking care of these animals, my family ensured that the animals got the best of everything. These animals were the centre of all our activities. There was not a single day that did not begin with a discussion about these pets. What to feed them? How to take care of a cat or dog that is ailing? What is the most nutritious thing to feed them? These were common dinner table conversations while I was growing up. So, needless to say, I have had a lot of practical training with respect to taking care of different breeds of animals. Today, I am in a very privileged place where I can share this information with pet lovers across the globe. I would have never been able to provide you with so much comprehensive information without the knowledge that I gained from my father, my family and of course my beloved cats.